Just when you think you are getting out of winter and summer is just around the corner the elements whack us with another dose of windy, blustery and wintry conditions which should add some more life to our rivers. The ranges which feed the southern rivers of the lake must have received a good bit of rain as they had some lovely colour this morning which was harbouring yet another run of good fish. The more fish we get into these rivers now the better as they should hang about for a little while and set up some good summer fishing for us. 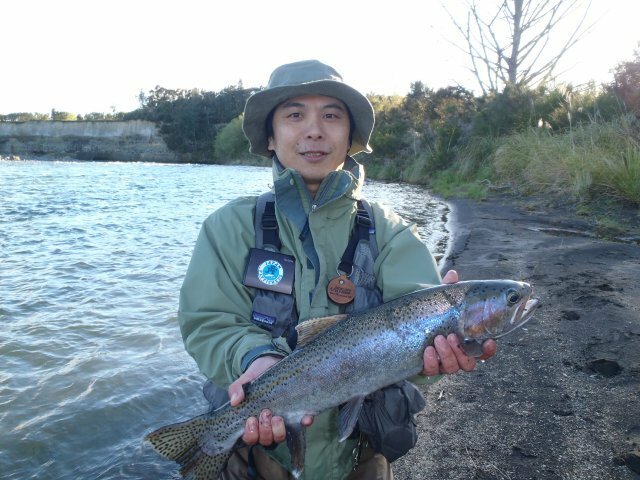 IÂ had to smile and laugh to myself while reading the report from TRM today as we have once again heard from some challenged anglers from the South Island which have not caught to many of our elusive Taupo trout. They must literally jump on the hook in the South Island as the Taupo fishery is not really known for it’s smart hard to catch trout yet they still seem to evade some.Â What annoys me the most is the comments thrown our way that the locals , guides and tour operators of Turangi talk the fishing up to be far better than it actually is by promoting it on our websites. I can honestly say that this website does not lie and when the fishing is good I will write about it but when the fishing is hard I will also tell you that-all the websites are truthful. I’m not sure how a fishing club managed to spend a whole week on the Tongariro and not catch many fish and find it even harder to believe why they would not ask someone some advice or change their tactics after the first day or two! If I went to the South and fished a river which I did not know much about the first thing I would do is hire a guide for a half day just to see where to fish and most of all how to set up the rig. Many anglers do struggle when coming to the Tongariro as they may be used to fishing very different rivers or lakes whether it be a spring fed creek in the south Island or a remote lake in the US. The number one rule is to get down to the fish with your flies and knock it on their nose to entice a strike. These are generally not resident trout andÂ it is hard to get them to move for a fly.Â If your flies are not banging on the bottom you are not deep enough and will be missing the majority of the trout in that pool or run. We all hate casting weighted flies or split shot but unfortunately it isÂ a skill in which is needed to be successful in such rivers. There are more than one way to skin a cat and there are a few sneaky options to get that heavy fly into the river without keeping it in the air risking a piercing. 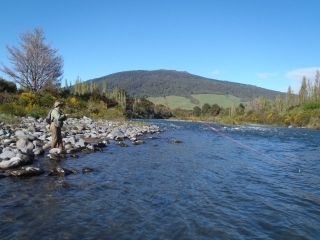 If you are not hitting trout in the first run through the pool give it one more quick run then move onto the next, this sometimes means getting into the truck and heading way down or way up river-not just staying in the braids!. Especially in the winter when the main runs are coming through this technique will get you onto fish as they will generally be mobbed up and if you find one pool that works well the next will probably be a producer too. Most of all seek local knowledge by stopping in sport shops, speaking to locals, hiring a guide or believe in the free knowledge which you source from various websites. 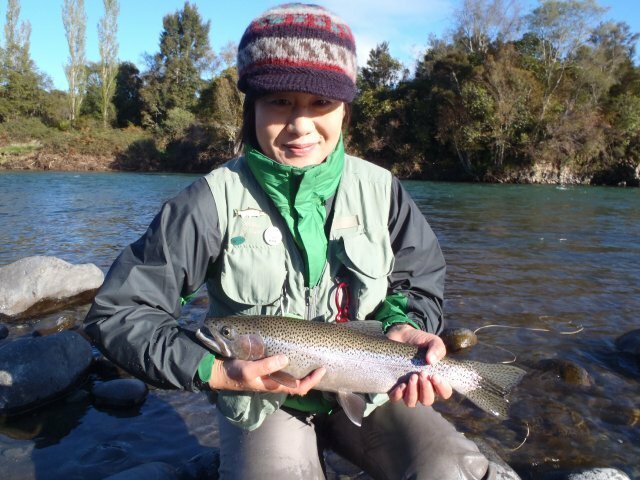 Today I had a pleasurable day on the river with two fantastic people from Japan -Takumi and Yukiko. They have fished the Tongriro for the past 5 years but as the river changes so much they have wisely invested in a local guide which keeps up with the rivers changing and as you can see from the results it was a wise investment. 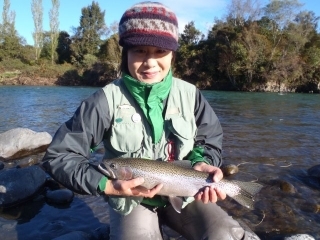 Takumi and Yukiko now are up to speed with what is working where and can fish with confidence for the next few days of their holiday. 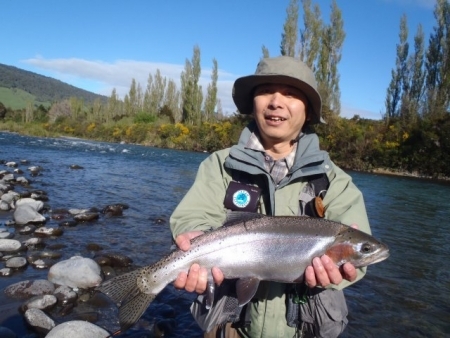 I am back out on the river in the morning with some clients from Hong Kong but will also be taking Takumi and Yukiko on a rafting trip in the backcountry on Friday soÂ I am crossing fingers for great weather and a few solid fish to finish of another great holiday in New Zealand.